Ohyo is the handy, collapsable water bottle that’s easy to take anywhere. Made in Sheffield, England. Fits in a pocket or bag. Good for the environment (re-useable; not disposable bottled water). I saw these yesterday (17 May 2013) in the National Trust shop on Dunstable Downs. National Trust shops incidentally sell a limited range of made in the UK products that are well worth a look and some National Trust shops sell locally produced farm products. Also available on the Ohyo website, elsewhere online and in shops, including some Boots and Marks and Spencer stores. The M&S Ohyo bottles are M&S branded. As well as the British made 500ml Ohyo bottle, Ohyo now make a British made 1000ml collapsable bottle too. Tip. To get around the airport security liquids ban carry an empty bottle and refil at an airport drinking fountain. 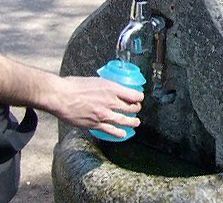 Carry one when you are out and about and fill for free at a drinking water fountain or household tap. to find out about finding free water sources near you. Some interesting information about the benefits of drinking enough water can be found here. How much water should you drink? The situation is complex. There is some guidance here on the NHS website. Ohyo collapsable water bottle. Made in England. Fits in the pocket. Dishwasher safe. 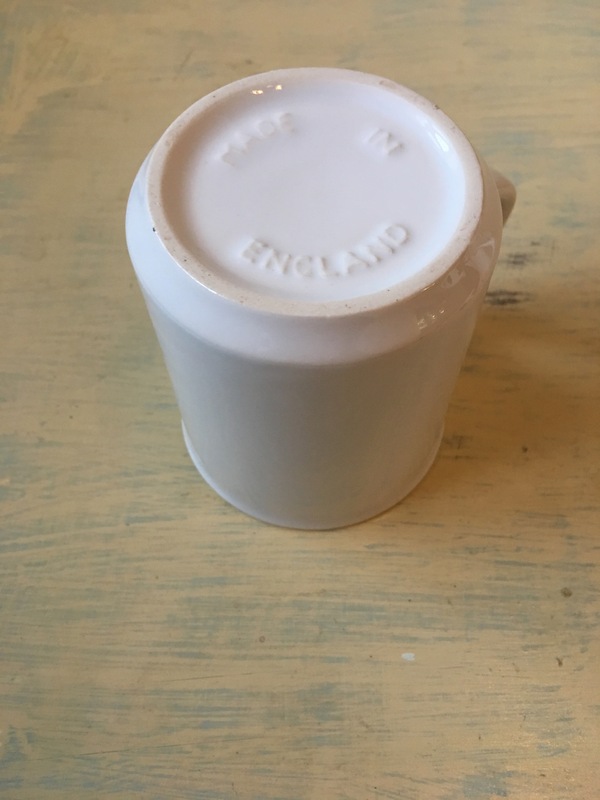 Bottle measures approx: 13cm H (when full) 3.8cm (when collapsed) x 8cm Diam. 500ml capacity. Designed, developed and made in the UK. 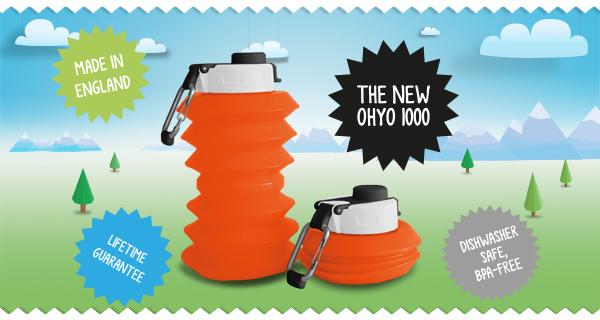 Ohyo 1000ml collapsable drinks bottle. Made in England. Disappointingly the Ohyo Bag is now foreign made. On the Ohyo website the Ohyo Bottle rightly proudly states it is made in England. From their kickstarter campaign I know Ohyo’s original intention with the Ohyo Bag was that it would be made in London by Jas Sehmbi in his London workshop, where the prototypes were made. It was great that it was being manufactured in London by Jas Sehmbi at Jas MB Ltd. However I now understand from their second kickstarter campaign manufacturing now takes place overseas. As I say, disappointing. This entry was posted in Gifts, Ohyo Collapsable Bottles, Outdoor Gear and tagged Collapsable Bottle, Drinking Bottle, Drinking Water, Find a Fountain, Fountains, Made in England, National Trust, National Trust Shops, Ohyo, Ohyo Bottle, Ohyo collapsable water bottles, Ohyo Water Bottle, Tap Water, Water on May 18, 2013 by ukmade.